I have been asked to travel to Charlotte, North Carolina, to speak to a group of news photographers about my second business, News Wedding Photographers, at the Southern Short Course sponsored by the National Press Photographers Association (NPPA) at the end of March. I have been a member of NPPA for 11 years and have gone to many of these conferences as an attendee. I am thrilled to participate now as a speaker among industry greats such as Pulitzer Prize winning photojournalist Rick Loomis, Michael Williamson from the Washington Post, Cathaleen Curtiss from AOL and David Hobby of Strobist.com. I will conduct an hour and a half session with Grover Sanschagrin from PhotoShelter.com and SportsShooter.com about making extra money (Grover will direct his chat toward selling photos online and I will speak about being a wedding photographer- something many news photographers do on the weekends). I will also take part in eight hours of portfolio reviews on two separate evenings, as well as man a table for News Wedding Photographers in the vendor show. It's going to be a busy few days! You can check out the full faculty line-up by clicking here and the schedule of events by clicking here. Sigh. This week FLEW! I can't believe we head home to sub-zero temps tomorrow already! Today we had a great lunch at T. Cooks at the Royal Palms Resort in Phoenix. It's become a tradition to have lunch there with my grandma each time I visit. So today, J, his mom Barbara and my grandmother all had a lovely lunch together. Yum! I just love the decor and scenery at the Royal Palms. I'd love to come back and photograph a wedding there, so if you're planning a wedding there and are still looking for a photographer- call me! I know my grandma and J's parents would love us to come back, and soon! Quick snapshots of J and his mother, and me and my grandmother. 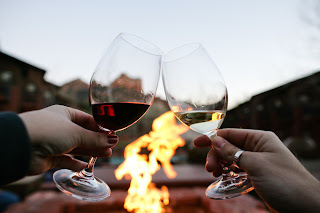 So remember that image I posted of us toasting our wine glasses in Sedona just a few days ago on the blog? Less than 12 hours after, I received an email from Amara Resort's media relations manager asking if the resort could use that picture on their website and in their promotional materials. Wow! Now, that's the power of the blog! In exchange, I received a few night's stay for a future trip. So, again, if you are looking for a wedding photographer in Sedona and Katrina & Andrew and Cameron Clark are booked, give a call! I won't need a place to stay. 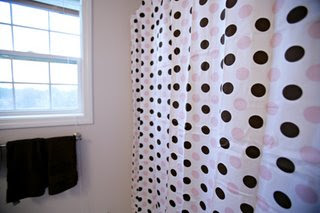 Likewise, I received an email from someone who mentioned she Googled "pink and brown shower curtain," was directed to a December 2006 post on my blog and wondered where I bought mine. Pretty wild, huh? We've had a wonderful week, but we are looking forward to returning home to those puppy dog wags and snuggles that will be waiting for us at the door tomorrow night! J and I took Zack Arias' super popular One Light Workshop today. Hosted at Melissa Jill's house in a suburb of Phoenix, 12 students had a 12 hour crash course on everything you need to know about using one light in various situations. Half of the day was spent on technical nuts & bolts instruction (I was having college photo class flashbacks!) and the other half was outside implementing those tips. It was a great refresher, and also helpful, fun, and inspiring to spend the day with a handful of wedding and portrait photographers- some of whom I am lucky to already know from other photography workshops and forums. Zack talking us through how he approaches light at a scene. Zack is very good at big, expressive gestures. Have I mentioned yet today how much I love my new 24mm 1.4? Look how sharp Zack is! This is an example of one of the scenarios he set up. In the background behind the model are palm trees, a parking garage and a busy road. Zack gets down low to shoot up toward the model to eliminate a cluttered background. First, we took a quick ambient exposure, and then introduced a softbox. Lovely. We repeated this against a wall, among some shrubs, and at night on a park bench changing different variables (light placement, the strength of the light source, the angle of the model, etc). Who's that handsome guy multi-tasking? Making work calls and shooting at the workshop. A few participants raved about their ShootSac's (Sergio had a sweet Boda Bag I liked, and Zack suggested a ThinkTank shoulder bag). I'm not sure I'll ever be ready to trade in my pj Domke bag for one of these trendy types. Earlier at the house, Melissa's miniature schnauzer puppy Dixie settled right in with the workshop participants on the couch. Foundation Forum friends Sergio (from Tucson) and Gulnara (from NYC). The Foundation Forum attendees L to R: Sergio, Gulnara, me and Ray (we needed one light on us in this shot!). Now I'm going to sleep! That was a long day! Update: This is our group picture! After a very busy '07 wedding season, J and I finally took a vacation this week. Well, sorta. We're mixing vacation with visiting family, networking and attending a photo workshop. I'll post more about those things later, but for now, I'll tell you about the mini vacation bit! We spent two nights in Sedona at the Amara Resort (a lovely, modern creek-side gem). We purposely didn't really make any set plans, so we were flexible to explore the town, it's beautiful red rocks, hiking trails and winding dirt roads at our leisure. We were delighted to have coffee with Katrina Wallace and Andrew Mejia of Sedona Bride one morning. And later treated ourselves to the most intense deep tissue massage I have ever had. We had a picnic by Cathedral Rock. And explored the artist community of Jerome, one mile up! The view from the top of the driveway at our resort (Snoopy rock on the left). Toasting at the resort's fire pit. On a hike somewhere in the middle of that rich red rock. Ooops! A few scratches on the rental car from off-roading. J's convinced he'll be able to buff those out. I recently purchased a 24mm 1.4. I love it! It captures detail beautifully. Check back at the end of the week to see what we've been up to in the Phoenix area! Hope you are all having a great week! We were surprised to see a favorite Maine shop where we are. Any guesses? Loyal blog readers, head on over to J's blog by clicking **here** and be sure to share a birthday wish! In the spirit of emilie inc.'s Pink Initiative that launched earlier this week, I'd like to share a few ways you can support breast cancer research and education. In an effort to be both more environmentally-friendly and more efficient, I have implemented a studio management software program called ShootQ. Developed by our friends from LaCour in Atlanta, ShootQ allows clients to view packages, securely sign a contract and pay for photography coverage (via PayPal), all online! It will eliminate a lot of paper and lost time sending snail mail. Clients will also receive email notifications when it's time to pay your balance and for other timely necessities, such updating you on the status of your album design or when a product has shipped! And instead of submitting paper timelines and wedding day notes, clients will be able to submit all of that pertinent information online! Pretty sweet, right?! The only change involved is to the client access section of emilieinc.com. This space was previously used to post pricing and contracts and will now shift to a resource area for prospective and current clients. Any questions? Let me know! And if you come across any hiccups while using the program, please let me know that, too! Also worth noting, ShootQ is also a generous sponsor of Roots Workshop! Thanks, ShootQ! I am excited to formally announce the implementation of emilie inc.'s perfect pricing™ Pink Initiative. The idea for the Pink Initiative is a personal one. 17 years ago last week, my mother's best friend Donna passed away from breast cancer. I was 12 years old then and can still recall visiting Donna in the hospital as if it were yesterday, watching as my mother carefully fed her lunch in bed and later applied her lipstick. 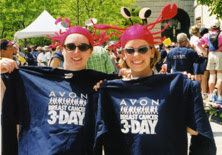 It was my first experience losing someone to this disease and Donna's legacy has always been the motivation behind my involvement in breast cancer activities. Donna's life has touched mine in another profound way, as well. In their sorrow, my mom and Donna's husband Steve helped each other in their shared grief and developed a friendship that eventually turned to love. Steve and my mom married, and I am blessed with a stepfather who I have long admired for his kindness, strength and compassion. **Although the NBCF is the only charity that will benefit from the Pink Initiative, emilie inc. also gives annually to St. Jude's Children's Hospital and the Make-a-Wish Foundation. 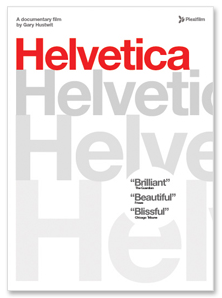 Based on the suggestion from Keith Jenkins, my former boss at the Washington Post, I purchased the DVD of Helvetica, "a feature-length independent film about typography, graphic design and global visual culture. It looks at the proliferation of one typeface (which is celebrating its 50th birthday this year) as part of a larger conversation about the way type affects our lives" by Gary Hustwit. J and I just finished watching it, and our review? Two thumbs up! I had flashbacks to some of my design classes from college while watching creators of various typefaces I know and use talk about serif and sans serif, x-height and cap height, zingbats and script, etc (If this at all peaks your interest, Wikipedia has a pretty good summary of type here). The interviews were peppered with real-life examples of Helvetica everywhere- from street signs to stores to IRS paperwork. It was very educational, and we both feel as tho we are now cursed, in a sense, because we'll be noticing the abundance of Helvetica in our everyday lives too. This got me thinking about my logo, and how I don't know anything about the history of Avenir, the typeface that has become the brand of emilie inc. So, I googled it and learned! 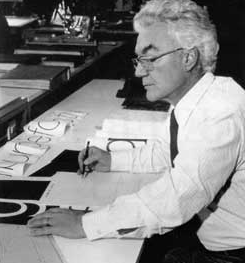 Avenir was created by Adrian Frutiger (born in Switzerland in 1928) in 1988. According to Linotype.com, "The word Avenir means 'future' in French and hints that the typeface owes some of its interpretation to Futura. But unlike Futura, Avenir is not purely geometric; it has vertical strokes that are thicker than the horizontals, an "o" that is not a perfect circle, and shortened ascenders. These nuances aid in legibility and give Avenir a harmonious and sensible appearance for both texts and headlines." There is a full interview with Frutiger here and a picture of him at right. And I was happy to see that Avenir is the 3rd most popular font, behind Neue Helvetica and Helvetica on linotype.com. Let me know if you spot Helvetica somewhere unexpected! And track the success of the Helvetica documentary by following the news on their blog here. A few months ago, I posted about the incredible story of the black lab named Molly who survived a boating accident in northern Maine last Memorial Day weekend, even tho her owner (Douglas Harmon) didn't. Molly swam to shore and then wandered for nearly 200 miles over the course of several weeks before she was found and reunited with her family. I was honored when Ladies' Home Journal telephoned me to photograph this amazing dog at her Scarborough home. The article is in the February issue, on newsstands now. And although the magazine only had the space to run the studio portrait of Molly, I thought you might like to see some of the additional images from this emotional assignment. The photo editor asked for both serious and fun images of Molly and the Harmon children (L to R) Jared, Ashley and Tim. Peanut butter on Ashley's cheek helped make this scene a bit more lively! If only she could talk, I'm sure Molly has quite a tale to tell about how she made her way back home! Sending continued strength and peace to the Harmon family! Thanks for welcoming me into your home and sharing your touching story.